THE DAGGER is a weapon with very special symbolic value. It is an important stage in the turning of the ordinary knife into a double blade thrusting and stabbing weapon. The dagger was known as a noble arm in the 12th century when it became a part of knight’s weaponry as the "knightly dagger", or more properly cross-hilt or quillon dagger, and later was used for additional defense in close combat with swords, court swords or rapiers. In modern times the dagger is a part of military equipment and it is worn with pride in some special forces as a sign of courage and daring in combat. In our collection we expose examples of different kinds and worldwide styles of Handmade daggers and we are trying to show their significance in world military ceremonies and blade making culture. 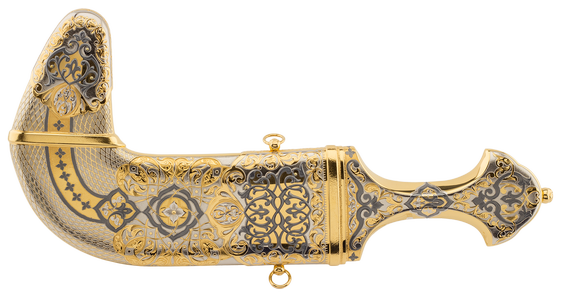 In the given category you may familiarize yourself with a collectible dagger. This type of weapon stands as the further evolutionary grade of a primitive knife. So what makes it different from the other types of bladed weapon? Briefly, it is specific due to the presence of several edges (typically, two) crowned with a very sharp point. It initially served as the weapon for face-to-face combat aimed to protect its owner and cause severe injuries to the opponent. We should also consider the ancient historical evidences of its sacred and ceremonial meaning. Thus, it was involved in different rites as a specific attribute for ritual sacrifices, body modifications and as the religious artifact itself. The earliest specimens of handmade daggers comprised of ivory, flint or animal bones date back to Neolithic era. Since that time humankind has mastered the art of smelting and forging, and later we can see further samples made of copper, iron and even gold. Antique Dagger also plays an important role in world history, as it caused the death of power players. Julius Caesar was cruelly murdered by the repeated series of assyrian dagger stabs. And he was just a man among hundreds and thousands of victims in the lasting battles of ideas and principles. There are two categories of custom made daggers in our catalogue: Aristocrat and Silver Age. Here you can also find the group entitled “The greatest Personalities” with William Cromwell, Otto von Bismarck, William The Conqueror, Genghis Khan having the blade made of stainless damascus steel and many other collectible daggers for sale. We pay attention to the most exquisite details, so that the final craftmade daggers be highly appreciated by our customers. To please their taste and satisfy the highest demands, the luxury wooden boxing of any article reminds of the true value of its content. Our daggers to order may become the gem of the whole collection or symbolize respect for its noble presentee.